Making a dandelion rhubarb pie is my official way to celebrate the end of winter. This pie is part custard, part fruit crisp and part fruit pie all rolled into one tasty goodness. Once I see the dandelions blooming and the rhubarb coming up, my taste buds begin preparing for my favorite way to welcome spring. I’m never disappointed. You won’t be either! I have always been a fan of of the lowly dandelion. Way back before it was mainstream information on how good dandelions were for you, I loved them. I love their cheery yellow color dotting the green carpet of grass and have never understood why people try so hard to get rid of them. I also am crazy about anything rhubarb! 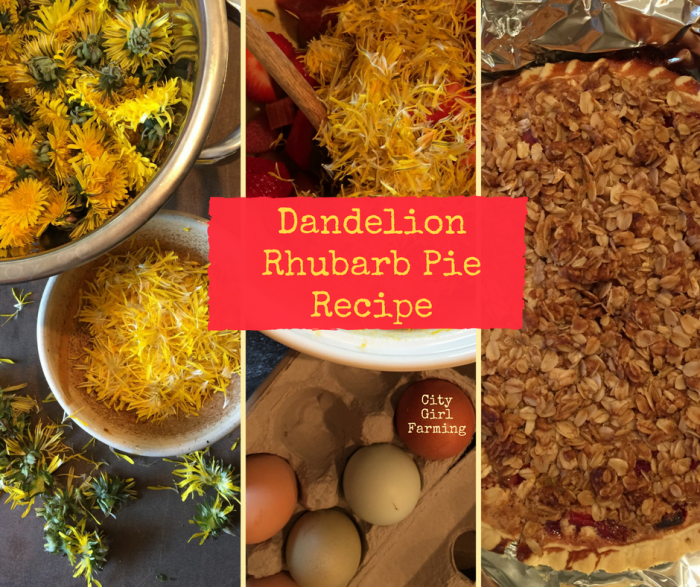 So I could barely contain my excitement the day I stumbled across a recipe for rhubarb dandelion pie over at Montana Homestead a few years ago! Oh, my, I had to make it. I basically followed the recipe over at Montana Homestead, but I tweaked a few things. For one, I made it gluten free, so I substituted all the flour in the recipe for a gf baking flour. Also, I decided to make a fruit crisp topping (very similar to the one in the original recipe but I substituted out MOST of the flour and used rolled oats instead). It was tasty. I served it to six people and everyone thought it was delish, even the ones that only tried it under extreme peer pressure from me. It is quite tasty. And it’s also a great conversation piece as you watch how people react to it the idea of eating dandelion pie…then watch as they ask for more! Before you make pie, you will need to pick some dandelions. It’s best to go early in the day when the flowers are fully opened. Make sure where you’re picking is NOT by a busy road (for toxic waste on your flowers) and also that the dandelions haven’t been sprayed with anything. The most time consuming part of making anything with dandelions has to do with getting the petals separated from the green parts. Most of what I’ve read over the years suggest that you cut the yellow petals off and then tediously pick the green parts that you (accidentally) cut off back out of the mix. That IS a way you can do it. But, along the way, I discovered a way that works WAY better. You get virtually NO green parts needing to be picked out (the green part is bitter so that’s why it’s good to have as little as possible in your final product). I simply take my thumbs, place them at the base of the dandelion (above the stem and below the petals–on the roundish, green bulb-like part) and split that base open. From there, it’s easy to pluck out the petals leaving all the green behind. (Watch the video a bit further for more details on how this is done). Now, let’s get down to the good part! Making some dandelion rhubarb pie! 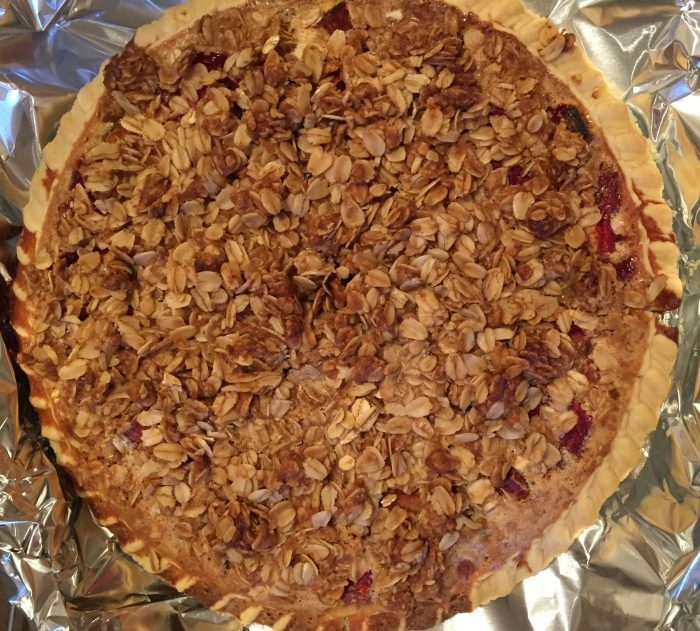 1 unbaked 9″ pie crust (use your favorite crust recipe or buy one–I often use a GF crust from Silly Zaks, and I have to say it’s the best GF crust I’ve ever had…while I’m great with regular, gluten-filled pie crust, I still haven’t tried my hand at the gluten free varieties). 3 tablespoons flour (I used GF flour blend) I’ve also used corn starch when I’ve run out of flour and that works fine as well. *I sometimes substitute 1 cup of the rhubarb for 1 cup of fresh sliced strawberries to make a dandelion strawberry rhubarb pie. Both ways taste great. 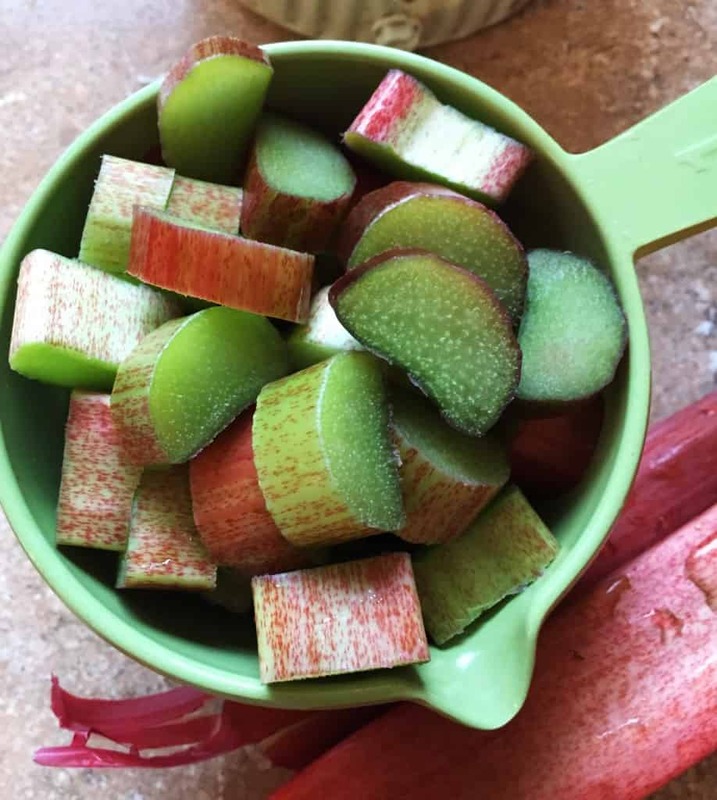 Prepare rhubarb by washing and slicing into small chunks (as well as the strawberries if you’re using them). Pick about a cup or so of dandelions. Rinse them off gently. And carefully break open and pull the petals from the green stem and leaves. I made a video below of the process below. It’s super easy and doesn’t leave any green bits behind that you will then have to dig out. 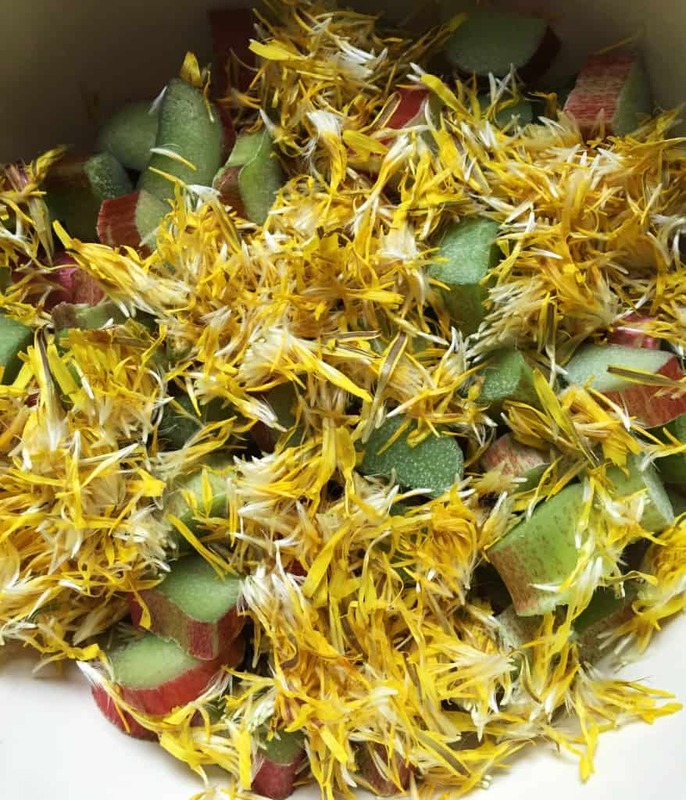 Once the petals are prepared, mix the rhubarb and dandelion petals together in mixing bowl. 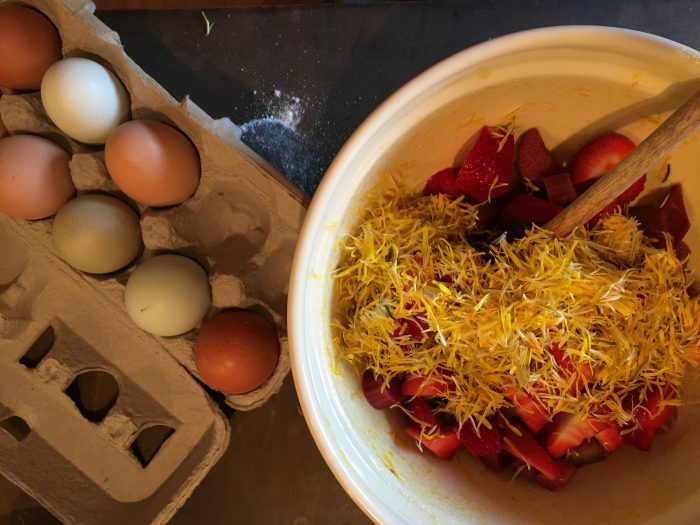 In a smaller bowl, beat the eggs, vanilla, sugar and flour together. Pour over the rhubarb/dandelion mixture and stir well. Pour into the pie crust. Next, combine the oats and brown sugar together in a new bowl. Cut in the butter, making the mixture crumbly. Spread it out evenly over the dandelion rhubarb mixture. Place this pie in a 400 degree preheated oven. Bake for 10 minutes. Reduce heat to 350 and bake another 35-40 minutes. The pie is done when the rhubarb is soft and the crust is golden brown. HOWEVER: when you pull it out of the oven, it might be wobbly in the middle (even though it is golden brown with soft rhubarb). Don’t let that part freak you out. It firms up when it cools a bit and will be perfect in the end. Special bonus: If you use your own free ranging flock of chickens, you’ll have bright-yellow-yolked backyard eggs like I did. This will give you a lovely yellowy custard-y inside filling (even more so since they’re mixed with the yellow flowers). All chemical and dye free! Gotta love nature! 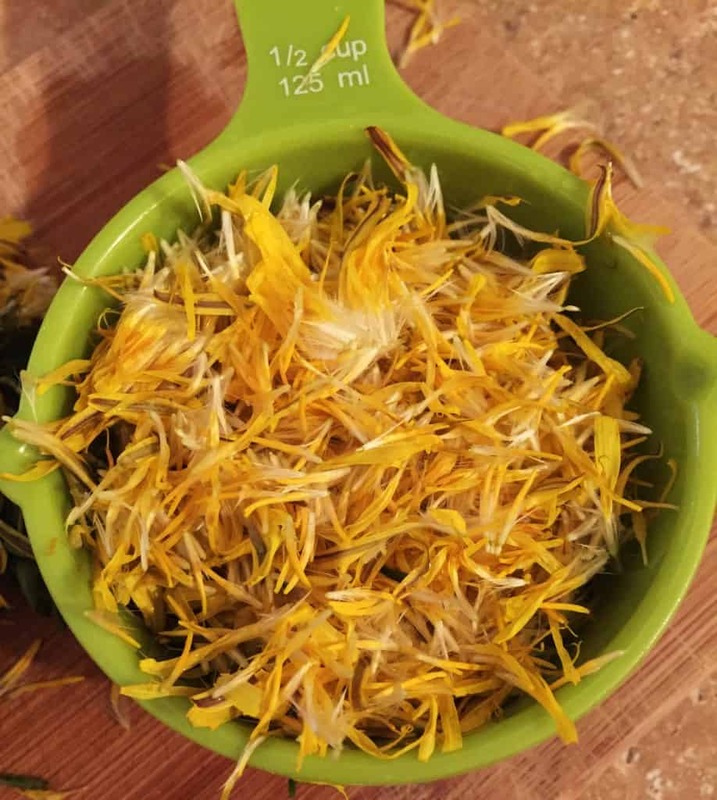 If you’re dandelion crazed or just open to new and different things, here’s a couple more posts I’ve done about cooking with dandelions: Dandelion Pesto and Dandelion Jelly. Stay tuned because I’ve been wanting to make dandelion wine for several years now and am finally going to do it THIS YEAR. If you’re also crazy about rhubarb, check out some of these posts from the City Girl Farming archives: Rhubarb Ketchup , Rhubarb Syrup and Rhubarb Day (filled with lots of rhubarb recipes). 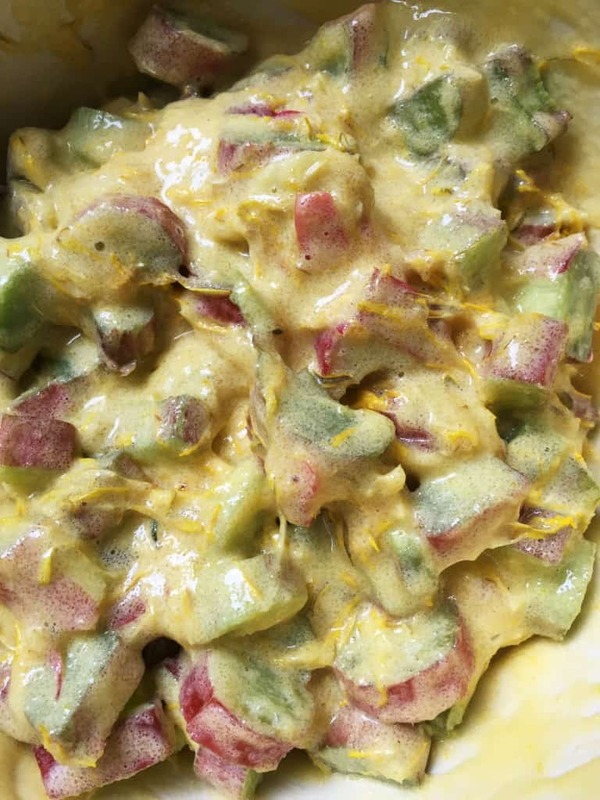 What are your favorite ways to use dandelions or rhubarb?